Its back to school time which means plenty more germs and the start of the cold and flu season. We ALREADY have stuffy noses. Did you know that one of the best ways to avoid getting ill is frequent hand washing? But in the MamaBreak house, hand washing is not something the kids enjoy. 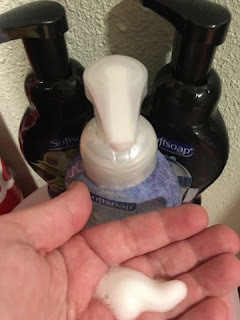 The kids were so excited when they saw SoftSoap in the mail though that we received for review. Who DOESN'T want to wash their hands with Anna and Elsa or with Yoda? 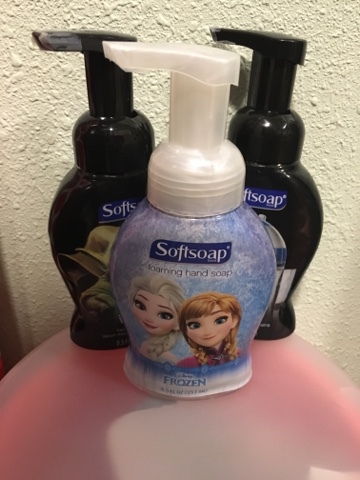 The kids loved the characters on the front of SoftSoap and I love that they were excited about washing their hands. And I don't know what it is about the foam soap, but the kids think it is so much fun! It looks fun, and they are washing their hands like champs! MamaBreak received SoftSoap to review here on the website. We did not receive any other type of compensation. As always, our experiences and opinions are our own.